First, a quick Public Service Announcement: School Library Journal has moved its blogs, including our beloved Fuse#8. Please take thirty seconds to mark the new address in your blogroll or blogreader, and check any other SLJ blogs that may have been affected. Thank you. Now, here are a few questions that have come up for the Fifth Annual 48 Hour Book Challenge. Pretty much. But if you set one up just for this challenge, you wouldn’t be the first to do so. Plus next week Maw Books is going to help get our blogs into shape with the mid-year Bloggiesta, so you might find that the 48HBC kicks off a new hobby for you. You can certainly count time reading aloud to your child  or to anyone, for that matter  as long as you’re using chapter books. Kids can always play along for the fun of it, but right now  off the top of my head  I’m thinking that I could make a few small prizes available to kid readers. They would have to keep track of their time (with adult help, perhaps), and write reviews/impressions/thoughts of their books on their sponsoring adult’s blog (you could do the actual posting). I’ll have a separate Finishing Line for kid readers and will select a few at random for prizes. We’ll give this a bit of a trial run. Any way you want. I’ve been reluctant to assign a specific method or charity, because I want to allow bloggers the freedom to choose  including whether they want to participate in this aspect of the 48HBC. You can donate a set amount per hour you read and even seek sponsors. You could donate based on the number of comments or books read or the total number of 48HBC finishers or something else I’m not thinking of. I’m supporting projects through Donors Choose, and specifically this DC school. You are welcome to help me meet their goal, pick another school local to your area, select something else entirely, or skip this portion of the 48HBC. Write me at MotherReader AT gmail DOT com and let me know what you’d like to donate. I usually pull together a bunch of things  books, jewelry, notecards, T-shirts, etc.  to make prize packages for the winners. I also like to have a few authors who’d be willing to send a personalized, signed book to a blogger for a few randomly selected “door prizes.” I’ll also take critiques, illustrator art/sketches/doodles, an offer to name a character in a book after a winner, or an eReader. If you have contacted me and haven’t heard back, then I must extend my apologies  I’ve been a bit overwhelmed, and have not handled everything as smoothly as I would have liked. Assume I’m interested, and I’ll be checking back through my email this week. One more question regarding Mr. Linky--will there be a place on your blog Saturday morning that I can sign on? Carl, I will have the Staring Line post with Mr. Linky up on my blog on Friday morning. I need one clarification on the Mr. Linky Starting Line post. Do we post Friday but indicate what our starting time is going to be if we are starting Saturday morning, or do we post to Mr. Linky when we actually begin? Great visual of a cage of book bloggers' babies and toddlers all tearing it up and having a good time whilst surrounded on all sides of the cage by reading moms and dads. 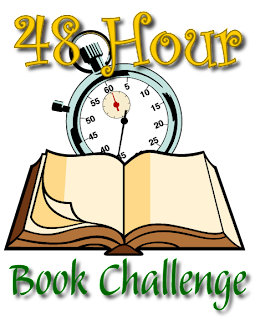 Here's another question (maybe a silly one), but can we count e-galleys read during the 48 hours? Karen, you sign-in whenever you begin the 48HBC yourself. The Starting Line post with Mr. Linky will be available Friday morning, but if you're starting Sat, sign-in then. Abby, sure you can read egalleys or ebooks in general. It's reading. Whoever asked about book clubs and book signings as part of your time. Oh, good question. I'd say either could count as your "social media" time, even though they are in-person events. So for every five hours reading, you can count one hour social media. For ten hours reading, you can count two hours and so on. Also, writing reviews definitely counts as part of the reading/blogging time. I'm liking the sound of this! Especially the cages. I literally LOLed when I read that last answer!! Just posted my preliminary stack of books! What timezone are we in for starting? Should I be working off my own timezone or off EST? Mystee, I'm not sure how the kid participation thing will work myself, so we're kind giving it a soft open in the Challenge. We'll see how it goes. Jodie, you can work within your timezone, but have to finish by 7:00 a.m EST Monday, June 7th. The weekend window is more than 48 hours to accommodate different time zones and work schedules.